When I see something left on the curb to be picked up by the trash man, my mind starts racing to create a use for this item. I begin to think I could totally use this for… and then, it becomes a “need.” I have to have it or my life will not be complete! This broken laundry basket I saw on the side of the road was no different, except I couldn’t think of a use for it. I grabbed it off the side of the road anyways, not even caring. So, it sat in my basement for about six month when it finally hit me “I can use it to as a planter.” Here is how I turned this trash into treasure. First, I taped up the crack in the side with some plain old packing tape. 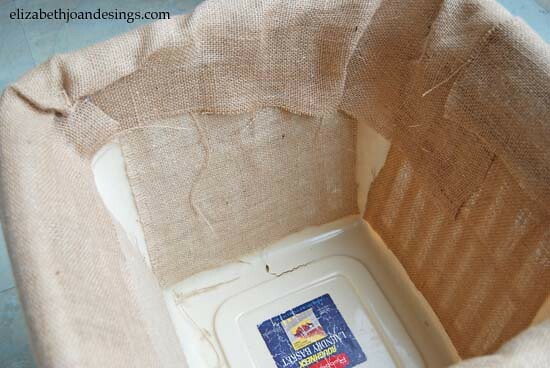 Next, I hot glued burlap on the inside to cover the slats of the basket. This was to help make sure my dirt stayed in. 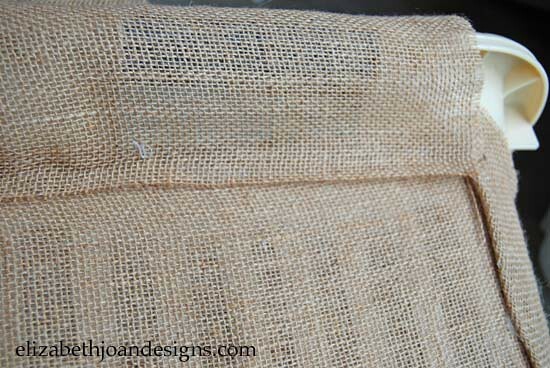 Then, I covered the basket with burlap, gluing the fabric down periodically. 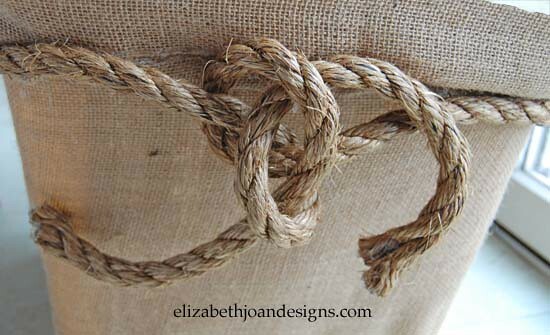 After that, I took a separate piece of burlap and wrapped it around the top edge and handles. I glued this edging to the inside of the basket. Then, I attached rope around the basket, making sure to cover the seam where the two fabric pieces came together. A little hot glue was added to ensure there was no unraveling of the rope. After all this hard work, I wouldn’t want that! Next, I tied the rope into this cool looking knot thing. Finally, I added the dirt and plant. You can’t even tell it was a broken laundry basket. Ye-haw! This is awesome! I love how it turned out and that knot is the perfect touch. Thank you so much Deborah! It was a lot of fun to do! How cool! That twine bow really finishes off nicely !! Thanks Marlena! Glad you stopped by! I think the same thing anytime I see things on the side of the road! Glad I’m not the only one. This is a great idea too. Might be good for a Mother’s Day gift! Thanks for the inspiration. I cant tell that your basket planter made out of laundry basket ! What a great idea to re-purpose things ! Beautiful basket planter !! Thank you Marlin! So glad you stopped by! Thanks Cathy! I really enjoyed this project! So glad you came by! I love this and that you shared it again from last summer! It’s such a great up-cycle project. Thanks Katie! It was a lot of fun to make! No way! This is SUCH a great upcycle! You are so imaginative! Thanks Jen! I love being inspired by unusual things! Thanks Katie! It was such a fun project! Thanks Melissa! Glad you stopped by! That’s a terrific idea! 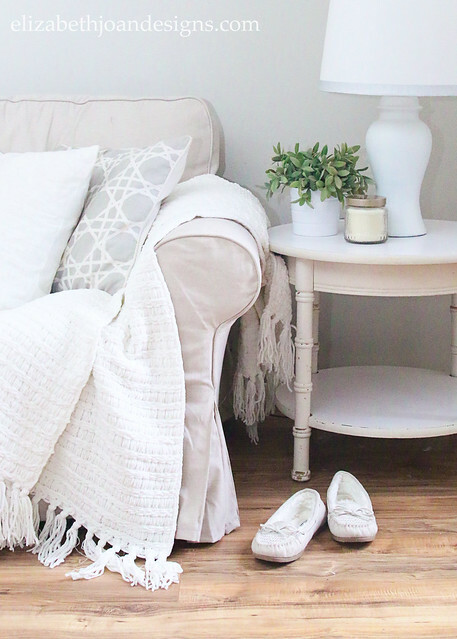 I love projects that give a second life to items. 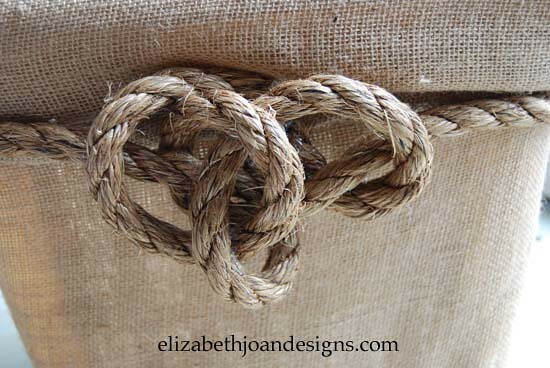 And I love the knot design you tied on the front. Thank you Audra! Glad you stopped by! Wow, that is such a creative idea. Upcycling at its BEST!!!!!! Thanks Mary! I am really happy with how it turned out! Such a good idea! Those large planters are expensive, so now I’m on the lookout to make my own – thanks for the idea! Hope you find one, Kim! Thanks for you kind words! What a smart idea! I love the rope detail!!! Thanks Amber! When I stated with the rope, I wasn’t sure what I was going to do with. But it the end it came together and I am really happy with it! Great idea! I think I might do this with a broken laundry basket that I have. Thanks April! Let us know if you do try this. We would love to see pictures! wow! now that is one good repurpose! Thanks You! 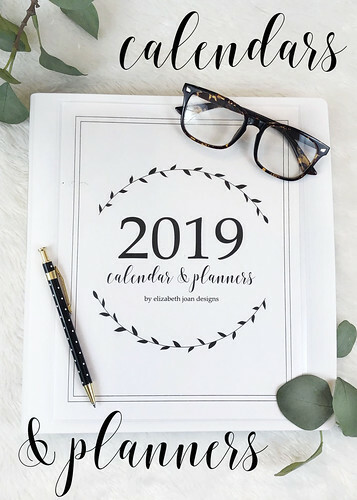 This is such a fun project to do! I just LOVE this. Question, how does it hold up when you water the plant? In the rain? Thanks Regan! I made this last June, and it held up very well. By the end of the summer the burlap had a little bit of staining toward the bottom. This year I just wrapped the bottom portion right over top of the old burlap and I am good to go! What a clever idea! It made me laugh that you picked it up off the roadside, and then it sat for a few month, it sounds like something I’d do, lol! I am picking stuff up all the time. My basement is full of “some day” projects. Thanks for the feature! What an honor! Glad you stopped by, Molly! You are so clever, what a excellent idea. I love the knot on the front. 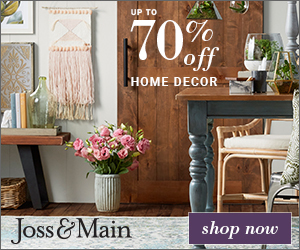 Just joined your email list, love your site. Thanks Gail! The knot wasn’t planned but it turned out great, so I just went with it. Glad you stopped by! 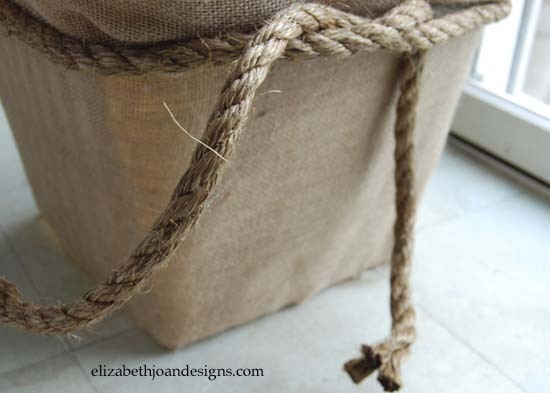 i would line the basket with a green garbage bag to keep water in and avoid staining the burlap. Hellen, that is such a great idea! Let us know how it works for you! Thanks Sandi! Please come back and share your new ideas with us! Glad you stopped by! Very pretty. I am wondering what it looks like when you water the plant. Wouldn’t the soil discolor the burlap or leave a water mark? Thanks Ginnee! Over the course of the summer it did start to show some discoloration, but it held up for pretty well and I recovered it for the next year. Thank you so much for publishing this DIY. 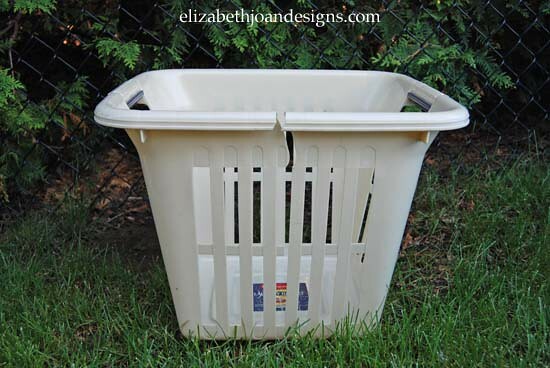 Who doesn’t have a couple(or twenty) old laundry baskets around, you’re amazing! i love this! My only question is, is there something you can put in the basket so you don’t have to fill it completely up with dirt? That would get heavy! How durable is it? I know it is cheap (yay!) but if care is taken in winter I’d like mine to last more than a season or two. 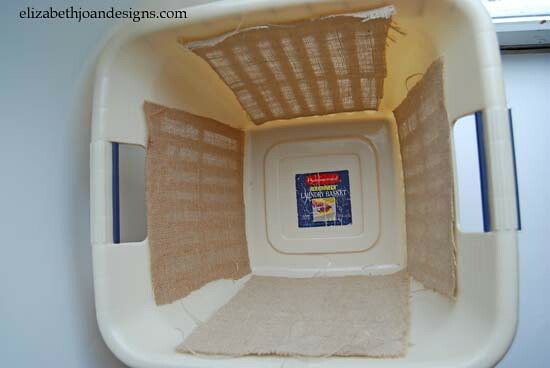 Also do you line it with plastic so when it is watered the covering does not get stained? Love the planter!!!!!!! I have all the materials to make this but the rope. What size rope did you use? It looks great. How did it hold up after you started watering the plant? Thanks Lynn! It held up great for about 1 year then I just re-wrapped it with more burlap to cover any staining that occurred. i am yet another fan of this lovely repurposed planter! An answer to Roxanne’s question regarding how heavy this pot will get, put those über irritating styrofoam packing peanuts in the bottom of of the pot (about 1/4 or so) and that should help with the weight issue! Hope that helps a little! When I first saw this planter, I thought it was terracotta! Hmmm…a skim coat of plaster-of-Paris, or whatever, and then paint the perfect color of your choice! 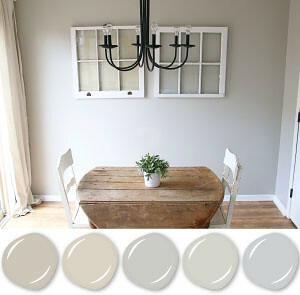 Terracotta, white, gray…your choice! Two of them parked at your entry. Yes! I am rambling, sorry. Anyway, thank you for sharing this idea. I love it! I love to repurpose things too. Your planter was genius! Actually when I first saw the finished product, I thought you’d used the basket as a mold for a cement planter.kudo’s to you for your creativity! Thanks Glennis! Glad you stopped by! This is really cool! I would be a bit concerned about it getting “dirty” (pardon the pun) after it had been watered a few times. Wouldn’t it be nice in the house with a large potted plant in though? This is such a cool idea, now I know what to do with my broken basket. Brilliant …. Thanks Antoinette! Let us know if you give it a try! This is such a fun looking idea will be trying it..
Wow! I have a broken laundry basket I was going to throw out. 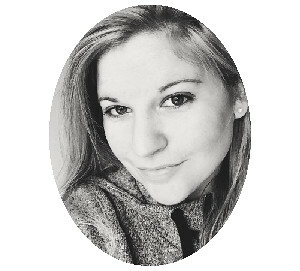 Lovely post, thank you for the inspiration! Beautiful but what if the burlap gets wet? You know I often wonder where my talent went, now I know… You just show us that you are loaded with so much great talent. Thanks for sharing such beautiful work. 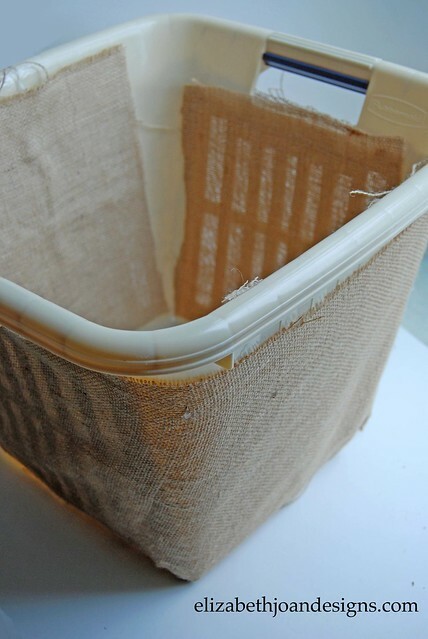 To wrap the basket you could use a natural cotton painters dust sheet, these are very inexpensive, and look just like burlap, they are basically a finer version. It’s a great idea to make big garden planters. I just found this adorable idea on Pinterest. I was wondering how your beautiful planter had held up in the weather and if it held together during plant watering . Thanks for the idea !!! This is beautiful. Very creative. I might have to try this. Absolutely brilliant idea. Just moved into a house with a boring yard and am always on the lookout for ideas. This is one I will try. May have to sideline my sewing for awhile and begin trash collecting!! Thanks very much for your post! Oh boy! This is great! However since my laundry baskets are currently in good shape, I think I will check the dollar store as they have smaller ones that I think will be great for this. I’m also going to try some styrofoam peanuts in the bottom. Thanks for such a great idea!!! That is a great idea, Jemilah! Hope it turns out great for you! 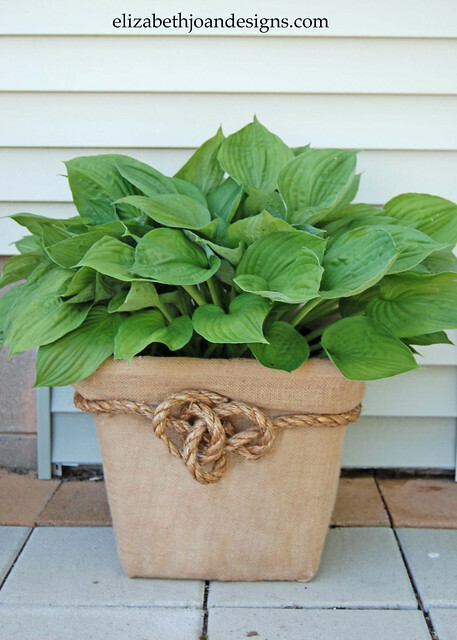 When you water the hostas, will the water seep through the laundry basket and burlap rendering the exterior burlap soiled and nasty looking? That would be my luck. I was wondering if some plastic on the inside of the basket (3 sides only) would prevent that; assuming that the the 4th side would be facing a wall. The other alternative would be to glue heavy plastic inside on all four sides, and drill drain holes in the bottom. Your thoughts and ideas…? Great idea. 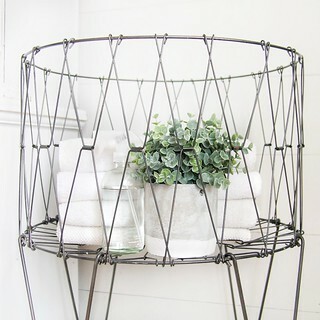 I’ve been wanting a big square planter, but they’re so expensive, and I have an old laundry basket I can use. First add those packing peanuts to catch excess water then line the inside of basket with plastic bag with holes in the bottom, then a few more peanuts before soil. I’m so going to do this. Thank you for the great idea. I just came across this on a Facebook post. I love the idea and the finished look. 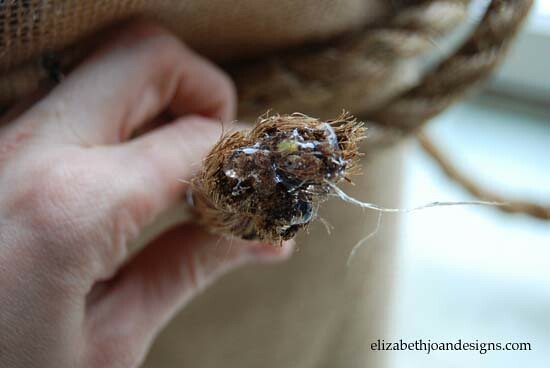 But I somehow question the durability and practicality of using hot glue which will not hold up to water over any length of time and also the burlap would get stained from the water and eventually get mouldy…I am thinking that perhaps before planting, lining it with heavy duty plastic would have been a good idea and made it last a bit longer. I am a crafter and I recycle, reuse, repurpose just like you and I’m not criticising…just sharing a thought. I love this idea I grow lots of Hosta if it only lasted one year as a lot of baskets do I’d be thrilled Old washing up bowls with holes put in could be used the same way My minds racing ???????? This is truly very impressive, it’s beautiful, great job. Debby I’ll be doing it at the same time as you, good luck, enjoy. This gives me an idea for those styrofoam boxes that meat gets shipped in. 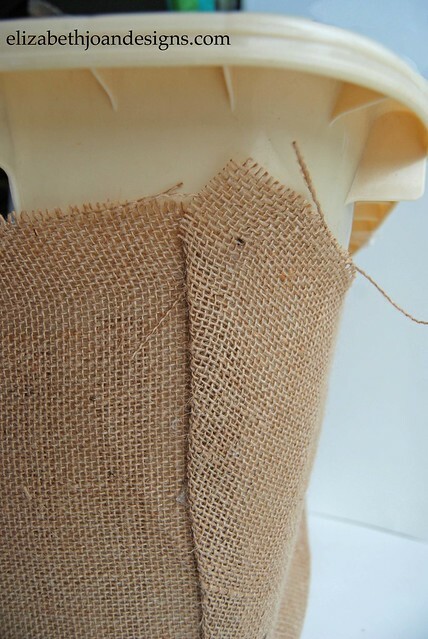 Drill holes in the bottom and cover the outside with burlap. That’s beautiful, what a great idea. I have a lot of burlap and was never sure what to do with it. I got it now thank u! !